The waterfall scenery along the Sand River in Lake Superior Provincial Park in Ontario, Canada is beautiful during the Autumn months. As you wander along the Pinguisibi Trail in Lake Superior Provincial Park in Ontario, Canada, the Sand River shows off its beauty as waterfall after waterfall cascades over the rocks. The scenery is beautiful all year, but when Autumn displays its beautiful colors in the forest trees, the area along the Sand River is spectacular. A beautiful trail to explore while visiting Lake Superior Provincial Park in Ontario, Canada. 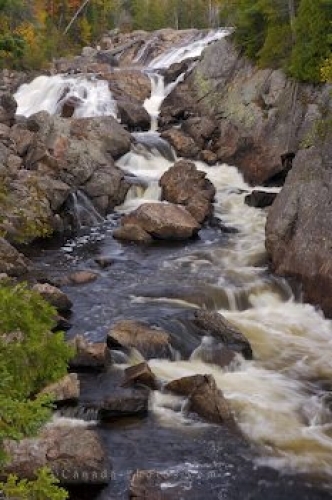 Picture of the stunning waterfall scenery along the Sand River in Lake Superior Provincial Park.